Do you feel like everyone has a website except you? Are you concerned about the high costs of having a professional website built for you? Our packages are affordable and will get your business noticed. All of our websites are custom designed and built to meet your specific needs and corporate personality. We will do everything we can to help you save money, including building in basic search engine optimization on each website as we develop the new site. All new websites are built using a the latest responsive design techniques so your website looks nice on the different devices available today. Smartphones, tablets, laptops, and desktop computers are being used to view your website. We make sure your website responds to the type of device and adjusts your content to match the screen size. Is your current website out of date? When was the last time the information on your website was updated? How does it look on a smartphone or tablet? Does your site need a whole new look? Give us a call and find out how we can bring your website up to date. There are many types of websites. 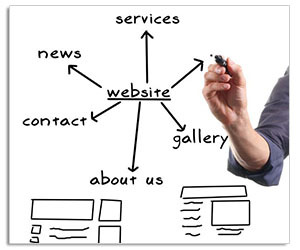 When you contact us, we will find out what type of website you need for your business. Will this be an information based website or an e-commerce website? Do you need a full online store or just a few PayPal buttons? Would you like to maintain the content on the website or would you like us to update the content for you? By answering these questions, we will be able to tell how your website needs to be built. Once you have a business site on the Internet, it is important to keep the content updated if you want your customers to keep coming back. This also helps the search engine rankings. All new websites designed and developed by us will include a maintenance plan for a specified period of time. We also offer low cost monthly maintenance plans, as well as hourly rates, to meet your specific needs. If you are looking to update the information you have on the Internet, contact Quad Computing for a free estimate. We can also assist you if your web developer is no longer able to support your website. Customized price quote for additional pages available. Training of up to two people on how to administer the store and add categories and products. Free maintenance for up to 6 months (minor updates only, new design work and additional pages not included). For services not specifically listed above (Custom Data Bases, Photo Gallery, Streaming Video, Blogs, Data Capture, etc), customized price quote will be provided. Maryland Web Development Company serving Baltimore County, Carroll County, Frederick County, Harford County, Howard County and the other counties throughout Maryland.